Winter season is here and what a better way to spend it than to do some ice fishing if you are an outdoor person. Most people fear going out in the cold and thus, exploring fishing grounds at such a time can be a lot of fun because you will have a lot of space for yourself. However, for you to succeed at ice fishing, you need to be prepared by having the required gear to survive the cold and also get to the fish in their hidden spots. Some gear recommendations are given below and these should be enough to keep you comfortable and also help you land some fish. 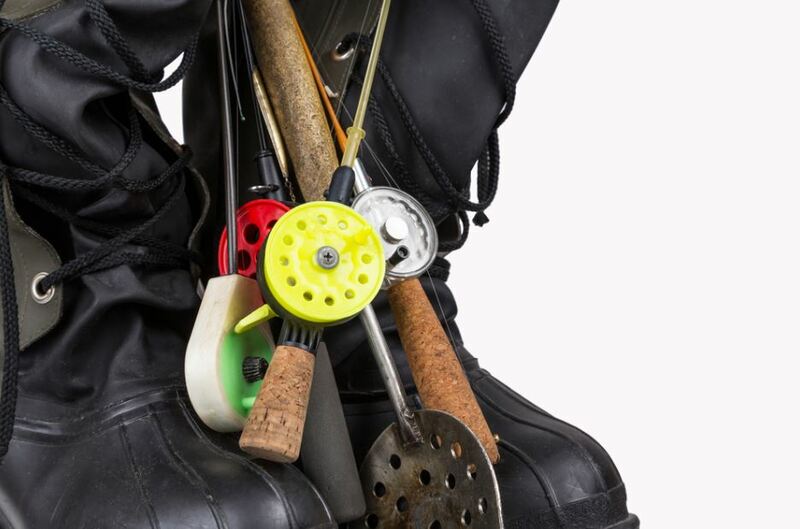 These are the most basic and essential gear that you need for any fishing expedition and thus, you must have them for ice fishing. Ice spinning reels are usually the smaller version of any reel series and coupled with short rods, they are designed to handle light lines and lighter fish. This is simply a rod and reel combination that is sold as a set. It is cheaper to buy but most fishing enthusiasts would agree that you will get a better setup when you buy the two separately and create your own customized combo. Basically, tip-ups involve setting up a small plank over an ice hole for holding a spring-loaded flag, which is released when fish take the bait. This setup allows you to cover a bigger space because you can set up multiple baits over a large area. It also increases your chances of catching multiple large fish. Your hands are very important for fishing. As such, it is important to keep your fingers protected from the cold using waterproof gloves that also cover your wrists and can slip inside your jacket sleeves for full protection from the harsh weather. You should also take care of your feet as much as you take care of your hands. Therefore, insulated and waterproof boots are ideal for keeping your feet warm, dry and comfortable during the whole period you spend outdoors. For the outerwear, ensure that you have waterproof, windproof and properly insulated jackets, pants and headwear. Frozen lakes and rivers are very common in the winter. To create a perfect hole in the ice so as to get to the fish, you must have an ice auger. A variety of them do exist and these include hand powered augers, which lets you drill manually by rotating the auger using your hands, gas-powered augers, and electric augers. Since you won’t be able to see through the ice layer, an ice flasher is a very important tool to have because it will be your eyes down there. Basically, an ice flasher is like a movable fishfinder that features a colored dial, which gives you information about the depth of the water, the depth of your bait and shows you when the fish start heading towards your bait. The alternatives that you can use for this are underwater cameras and ice fish finders, but most anglers prefer to work with ice flashers because they are far more superior. As much as insulated clothing keeps you warm as you fish, an ice shelter goes a long way in protecting you from extreme cold winds. Hub shelters are very affordable and usually have frames that expand outwards and lock into place, forming the structure. However, they are somewhat difficult to move, which means they can be a big inconvenience if you like changing fishing spots regularly. A flip-up shelter features a plastic made sled base, which makes it glide very easily over the ice and thus, won’t be a bother if you like changing fishing spots. On the inside, this unit features built-in seats and storage compartments for keeping your gear. However, they are usually very expensive. Ice fishing can be a lot of fun if you have the above gear. However, these are just the most basic things that you can bring along for such an expedition. For more information about these and other recommended ice fishing gear, go to https://usangler.com. The 13 Best Hikes in Europe Hiking is one of the most engaging physical activities.